On a day when you have to compete against Andy Murray in a Wimbledon final, Lewis Hamilton in the British Grand Prix, not to mention the Annual Cheadle Road Race, you might at least expect the weather to be kind. Especially when you are celebrating your 25th anniversary. The morning of Sunday 10 July dawned windy, squally and rainy. It was so wet underfoot early on in Ford’s Field that the path into the field had to be abandoned eventually (after a lot of work by the fayre tractor-driver hauling vehicles out of the mud!) and exhibiters had to be re-routed on to the site. Well done to volunteer Nola Ward who acted as an impromptu traffic police officer! We won’t mention the tent that simply blew in the air and sailed away. But… as they say … the sun shines on the righteous. Unbelievably, by late morning, the bad weather was over, and the crowds began to stream in like nothing had happened. It was another great Fayre. The piece de resistance’ had to be the float, on the truck: celebrating a wonderful 25 years in existence of this event. 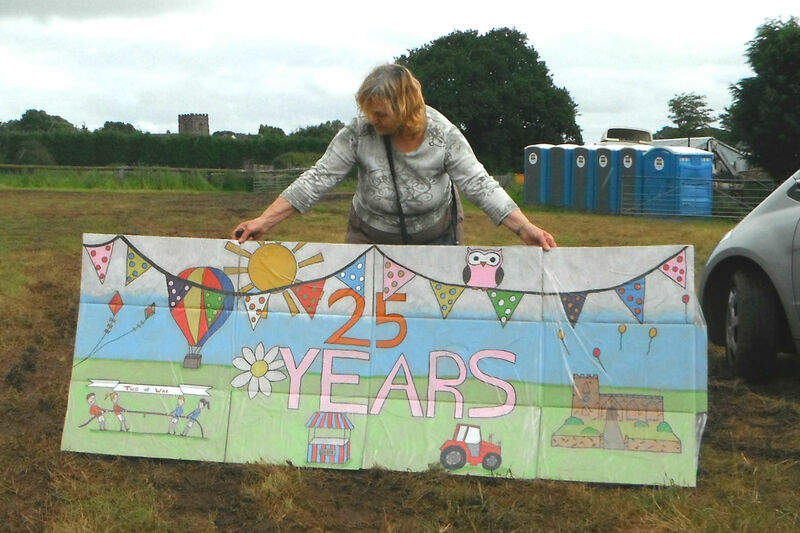 The Draycott Brownies decorated the float (in more ways than one) – it was a magic idea, and also alerted the neighbourhoods to the presence of the fayre. The great thing about this fayre is that there is something to watch or to do almost every minute – even though the carousel and bouncy trampolines and quad-bikes kept most of the children pretty busy most the time. Some children also joined in with the drummers, some flocked to the puppets, and some decided to do battle with the Vikings (the Vikings lost). If we’ve forgotten anyone – our apologies. It was also wonderful to see the oldest person in our district turn up. Betty Hammond (the former parish councillor) is well over 100 years old, but she was there – determined to see her grandson Anthony Hammond perform his usual startling feats of wood-sculpture. Incidentally, a kind lady bought young Sam a ticket to try to win Anthony’s finished sculpture (a wooden owl) – and it turned out to be the winning ticket! A nice story. Draycott Fayre 2016 – a perfect way to spend a day! Draycott Summer Fayre 2015 is on its way! If the weather forecasters are right, this summer is going to be a good ‘un – and slap bang in the middle of the British summer this year comes the twenty-fourth Draycott St Margaret’s Summer Fayre – so, it’s time to get yourself ready! The date for your diary is Sunday 12th July, with everything kicking off at 11.30 and finishing just before 5pm. After two years in which the main attraction was the Viking re-enactors (who were brilliant), John Clarke and his team have decided on a change. This year the fair goes back to the 17th Century and the time of the English Civil War in which Royalists fought the Roundheads. 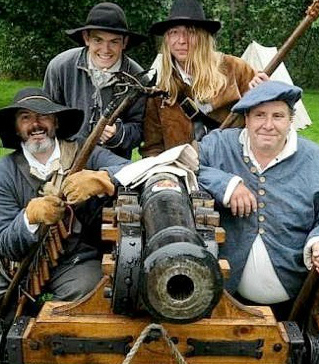 The particular re-enactment group coming this year are from that very era and call themselves ‘Sir George Lisle’s Regiment of Foote’ (pic: right) which is also the name of an actual regiment which recruited from North Staffordshire during the Civil War. They are part of the famous Sealed Knot society. 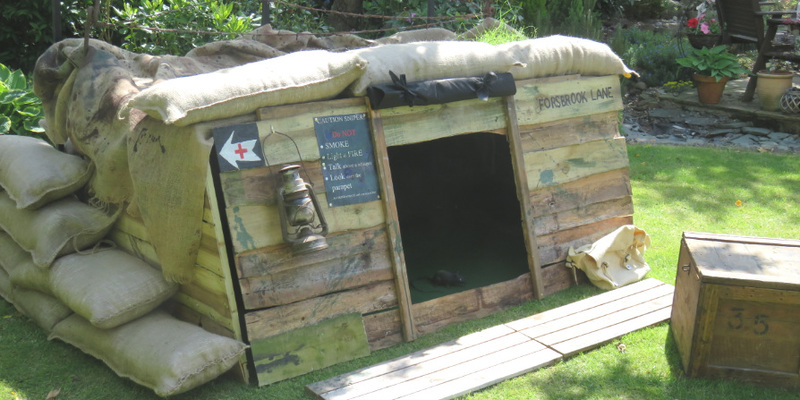 Expect loud bangs, ancient regimental manoeuvres including pikes, and lots of fascinated children to be watching! There will two displays during the course of the day. Also new this year will be local strongman Fred Burton. Fred has been performing extraordinary feats of strength down the years, and, at the fayre, he will be making three new attempts on the Guinness World Book Of Records – all of which will be monitored by properly appointed referees. Believe it or not, Fred will make these lifting-and-carrying attempts with… his little finger, and his teeth…. But the old favourites are not ignored. At the top of the field, as part of the usual classic & historic rally, hundreds of vintage vehicles (from cars to tractors), and working engines, will all be on show. The Potteries Omnibus Preservation Society will also be running a 1930’s double-decker omnibus in a route round the area, from Tean to Cresswell to Blythe Bridge, picking up anyone who wants to jump on! The fun-fair and stalls will be next to the rally. The first actual feature on the day, taking place at 11.30am, is the popular Dog Show. All fayre visitors are invited to enter their pets into the competition. 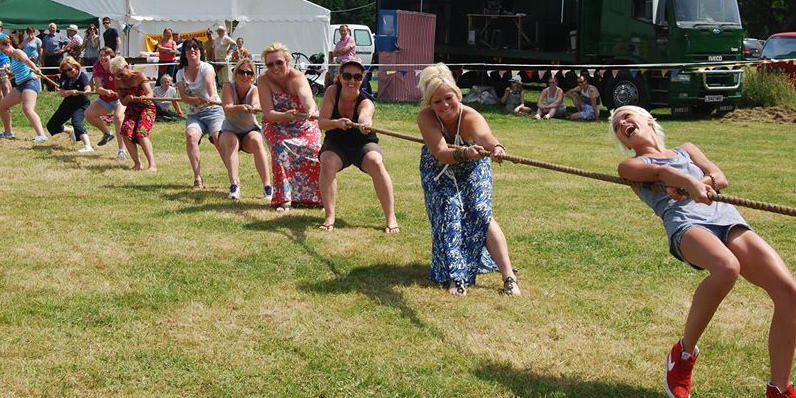 The fantastically enjoyable Family Sports competitions are back – who can forget how the children memorably beat the Vikings at Tug o’War two years ago? Not to mention the day that the Draycott Ladies showed the Men how a will-to-win can always beat ‘experience’. Inside the marquee, will be bric-a-brac stalls, tea & cakes, and a bar – not forgetting the fantastic burger-stall (where the queue never dies down….) – plus children’s entertainers all through the day. Many local organisations will also have stalls displaying what work they do in our area – in case you had forgotten how much goes on this area…. The great thing about the fayre is that almost all the organisation and support for it comes from within the parish district (Draycott, Cresswell, Totmonslow and Draycott Cross). There are no ‘paid professionals’ here; it all comes from the heart. 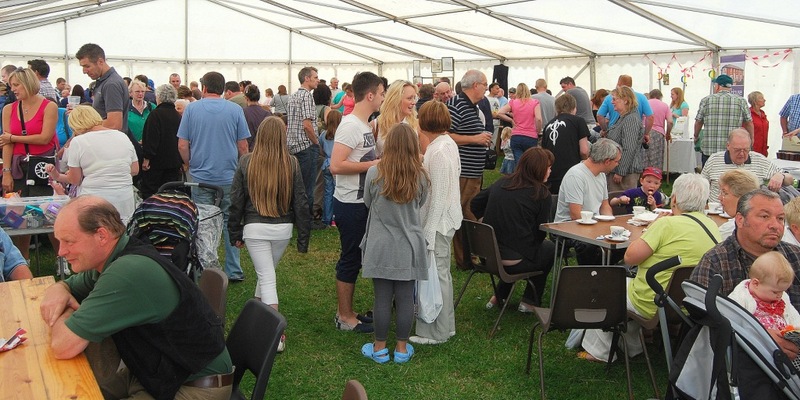 The bar tent is always well-attended…! Much support comes from St Margaret’s Church itself where the parishioners and church wardens are always the first to volunteer their services. And, once again, another set of stalwarts have stepped forward to man the hot, tiring and very successful burger-stall – well done to the staff of the Draycott Moor College. In fact, most of the stalls and activities are also run by local people, including members of the Draycott Women’s Institute and the Craft Club. Incidentally, if you belong to a local organisation, and you’ve forgotten to get yourself a stall or otherwise get involved at the fayre, it is not too late, but do hurry. 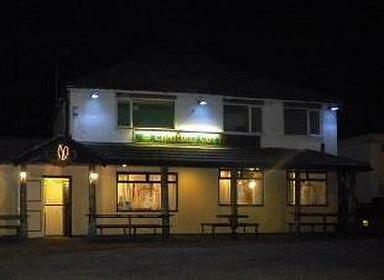 Phone John on 01782 396190, or, if you are a Facebook person, message the Fayre’s Facebook page. And it’s great to know that much of what you spend, whether it’s for the entry fee, or at the stalls, will makes its way back to Draycott. The profits all go to supporting St Margaret’s, the ancient church which has overlooked this village for the last seven hundred years – and hopefully will for many more. Admission is £4, with children under 16 getting in for free. See you on Sunday the 12th! Well ! What a day…! Sunday 14th July 2013 will be remembered as the day the Children of Draycott defeated The Vikings in battle, records were set for fund-raising (and hot temperatures! ), some three hundred vintage vehicles filled the ground, around two thousand people attended – and the bar ran dry! Draycott-in-the-Moors’ Summer Fayre & Vintage Rally 2013 was, by any standards, a terrific success – and well done to all the volunteers (under the expert leadership of John Clarke) who really were the ones who made it happen. The highlight of the day was the appearance of the Y Ddraig Viking re-enactment group. They were brilliant. Right through from setting up a realistic-looking camp, complete with cooking pots bubbling up a ancient vegetable stew, to displaying a brutal form of early hockey played 1200 years ago, and a display of ancient weaponry, they really played their part. 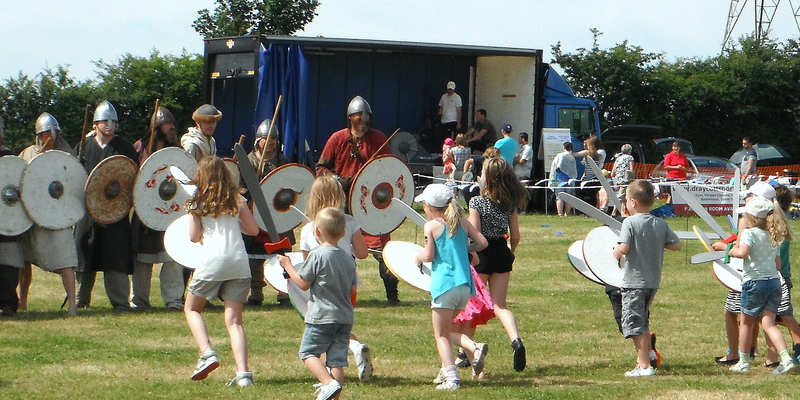 However, their Viking warriors made one terrible mistake – by challenging the children of Draycott to an open battle. There could only ever be one winner in such a contest. The children suffered no casualties whatsoever… and only one Viking got away. An album of lots of photos of the day can be found by clicking here. When you go to the link, just click the play button to start the slideshow; then we suggest you set the speed at ‘slow’, and don’t forget to click the ‘Show Info’ button to see the captions. Have fun with the memories. And, if you too have photos that you took on the day, we’d love to see them, and to then put them up on the gallery too. Just email us with any photos you can share. Local organisations however were the backbone of the day. The Draycott Sports Centre gets an honourable mention for setting up two temporary tennis ‘courts’ which were never empty all day, as youngsters queued up to have a go. The district Girl Guide group helped the MC for the day, John Beardmore, to organise the games; and numerous groups, including the Draycott Women’s Institute, staff from Draycott Moor College, and members of St Margaret’s Church worked furiously on their different stalls to raise money for the day’s good cause. Admittedly, having around three hundred vintage motor-cars, buses, tractors, wagons, motorbikes and traction engines on the site – all carefully looked after by their owners – was bound to keep most of us quite busy. A minor disappointment was that the promised Dakota plane fly-past didn’t happen. Apparently, the plane had encountered a problem in an earlier display, and had had to cancel. However, the Innringers handbells group performed twice, making subtle and fascinating music. For a fuller list of who were the main draws, check our Fayre schedule page. To give the event its full title, it should be known as St Margaret’s Draycott Summer Fayre, as the day is specifically to raise money to pay for the maintenance of the village’s parish church – which is almost 800 years old. The event is also so named because it falls very close to St Margaret’s Day. So therefore … the bottom line is: did the event raise a significant amount of money? Well, the full accounts are not yet in of course, but with around a thousand people paying at the gates and probably another thousand (volunteers, participants etc) on the ground, that means the main stalls and the raffle-tickets salespeople (well done to them too!) must have done great business. Organiser Daniel Newton, who was in charge of the bar, also saw his stock run completely dry (well…except for wine-spritzers, and we don’t count those) – which can’t be bad! The Draycott Fayre 2013 was the twentieth of the modern era. The first, we are told raised just over £200 (! ), while this one has surely exceeded not just that sum but also last year’s profit of £6000. Let’s hope so – for the old church’s sake. Other winners: Julie Ingle (1732), a £25 Fuel voucher / Jane Meller, a Mount Nurseries voucher / M Cheadle (131), a Planter from Draycott Nurseries / Mrs Seymour (1456), a Shoetime voucher / Mavis Bullock (17), a Stoddard’s Travel voucher / Beryl Carp (1583), a Queens Arms at Freehay voucher / Olive Davis (217), a Draycott Arms voucher / Mrs Dyke (187), a Ford’s Of Blythe Bridge voucher / George Marsh (995), a Tesco voucher / Jack Cartlidge (1555), a gym-pass for 2 / Mrs Elks (247), a gym-pass for 2 / Margaret Plant (1049), a gym-pass for 2 / Steven Bedson (1625), a personal training session / Alistair Barton (760), a circuit-training pass for 2 / Diane Winfield (782), a circuit-training pass for 2 / P Beardmore (1445), a tennis lesson. Draycott Fayre – take part! Preparations appear to be going well for this year’s Draycott big fair, which is an all-day event on Sunday July 14th. One tiny disappointment is that a large craft-fair, planned for the previous afternoon (the Saturday) as a sort of warm-up to the main event, is now not going to take place. Things simply couldn’t be put in place in time. However… the Sunday is getting fuller and fuller! And you too could add to the event. Chief organisers John Clarke and Daniel Newton have told us that what is particularly pleasing is the amount of involvement from local people. Members of The Draycott Sports Club, the local Young Farmers group, the Draycott WI, the Draycott Plant Nurseries, the Huntley Wood Recreation Centre, the Axis Disco, the staff of Draycott Moor College (who have volunteered to run the burger stand), members of the St Margaret’s Church congregation who are running book stalls, refreshments stalls, craft stalls and cake stalls, and more, will all be putting on displays or stalls for your ‘delight and edification’ – as the saying goes! And don’t forget: there is also a family disco in the marquee on the field on the Saturday evening (children are free to get in). Tickets are going well, so it should be a fun occasion. Check out the details of all this on our Draycott Fayre page. As you know, the fayre is totally run by village volunteers, who are trying to raise money for the running costs of Draycott’s ancient and beautiful church. St Margaret’s is over 700 years old, and in need of constant attention. So – why not take part? Just tell John what you think you can do, or go along to an organisation committee meeting. And, even if you can’t make it on the day, you could still help by: advertising in the programme; or selling raffle tickets. It’s only £10 to take an advert in the programme (which is on sale on the day). To take out an advert or to offer to sell books of raffle tickets, contact the fayre Organiser. So….see you on the 14th (and at the family disco, too)!